Things are really about to start picking up here on the dairy. A combination of mild temperatures and plenty of moisture over the last few weeks have really made our spring forages grow, and weather permitting we'll begin to harvest next week. Off the top of my head, I think we have about 55 acres of rye, 45 acres of a tritcale/ryegrass mix, and 35 acres of ryegrass. We're looking at spending 2-3 weeks harvesting (depending on the weather), so I'm thankful that all the acreage won't be maturing at the same time. The harvest technique we plan on using involves cutting it with a hay mower, raking it into a row, running it through our silage chopper, and packing it into a silage pit. We actually have two silage pits available, but depending on how much is left when we fill the first we may opt to make baleage out of the remainder of the crop. Just as things start picking up in the field, things will be slowing down in the milking barn. Our numbers are starting to come down thanks to dry-offs and transitioning some low producers into the beef market, but our per cow production is still relatively stable. Hot weather is just around the corner though, so milk production and conception rates will both take a dive in the hot, humid Alabama summertime. Hopefully milk prices will improve enough to offset the loss in production! I took a stab at defining "humane treatment" in a post on the YF&R Blog. Check it out, and feel free to leave your support or hate mail via the "comments" on that site. Our daughter was born around 5:30 Thursday evening and weighed in at 8lbs7oz. Everyone's doing great and we should all be back home on Gilmer Dairy Farm sometime Saturday. Thank you all for your thoughts, prayers, and well-wishes over the last couple of days! And yes, she will learn how to milk cows once she's old enough. I know it doesn't sound like much, but it'll keep us busy until milking time! This morning we'll be focusing on reproduction. We have already AI'ed two cows, and will be doing a timed-AI breeding on 14 more around 10:00am. We don't typically do timed-breedings, but our conception rate from May-August is not good at all so we wanted to get the process started. We like to begin breeding our cows once they've been in milk for 60 days, but our average DIM at first breeding (relying on visible heats) has been closer to 80 days. Timing these cows will give us an extra opportunity to "heat-watch" and breed them again prior to hot weather should they not conceive with today's breeding. we're expecting a handful of calves and quite possibly a daughter to be born this week. If my blog goes silent for a few days, it's because of the latter. I hope you have a great day, and remember to get your three daily servings of milk and dairy products! U.S. Rep. Robert Aderholt (R-Haleyville) announced Thursday that he has co-sponsored an amendment that would prevent the regulation or taxation of farming gas emissions. As of now, greenhouse gases and farm emissions are not subject to Environmental Protection Agency regulation through the Clean Air Act. However, the Greenhouse Gas Amendment co-sponsored by Aderholt would put into law that greenhouse gases not become subject to the Clean Air Act at any time in the future. The amendment would protect farmers against taxation of fertilizer emissions and the so-called “cow tax”. I'd like to wish Congressman Aderholt and his staff a very happy Ag Day, 'cause he sure made mine a little happier. Today is National Agriculture Day, and all around our country farmers will be speaking to classrooms, giving farm tours, and telling their own unique stories about their farming experiences to consumers. I hope that you, whether you're a farmer or a consumer, will have an opportunity to join the conversation today as we celebrate both our nation's agricultural heritage and the hard work, dedication, and innovation that allows fewer than 2% of our population to provide our nation's food and fiber. Back on Gilmer Dairy Farm, our veterinarian will stop by this morning to perform a herd check. We've got just over 50 that we're hoping he'll confirm pregnant and about 4 that need a general exam. We'll also clean up around the place this morning and then after lunch we'll tune in to the NCAA Tourney on the parlor television as we milk this afternoon (even though our team has been eliminated). The sun has come up, birds are singing, the air is crisp and cool...apparently I didn't die and go to Hell for raising livestock (as a couple of nice e-mailers implied I would). 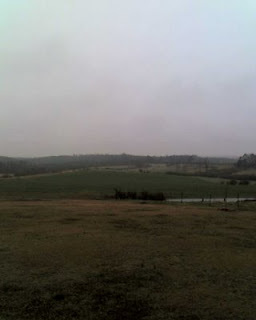 Yesterday was pretty routine on the farm, and pretty wild off of it. No, I'm not talking about St. Patty's Day celebrations, I'm talking about the feedback I received from making comments on this blog and on a couple of others about animal care. If you didn't see them, I and many of my peers made a point yesterday to talk about the high standard of care that's given to animals on 99.9% of the farms around this country. This was in response to HBO's "Death on Family Farm " documentary and the flood of accusations that the abuses uncovered are commonplace in America. Unfortunately, there's too much of a philosophical divide to have a productive conversation with some of these folks making those claims. I mean, they have actually likened my raising of animals to human slavery and the Holocaust! Today really is shaping up to be beautiful. The stars were out in all their glory early this morning and I don't know if we could ever come any closer to having "perfect" weather. We have several odds and ends to take care of this morning. We'll be replacing the a/c thermostat and rear window on our Case 5230 (and painting it as well); we'll be repairing the front end on our International; and the chainsaw, bushhog, and fencing tools may all get a workout today. The ground has dried enough that we've been able to start grazing the milking herd again in the mornings. They seem to be slowly picking back up in production after the big dropoff over the wet weekend. The rain did have an adverse effect on milk production, but it's been great for our spring forages. With plenty of soil moisture, the rye and triticale we planted is really taking off now that the sun's back out and it's getting warmer. I swear I can almost see it growing before my eyes! Hopefully I'll come back home at lunchtime with a whole lot accomplished and not quite so much hate mail in my inbox. I watched HBO's Death on a Factory Farm last night, and must say it was disturbing on multiple levels. Before I go any further, let me add that I realize that there are people out there who are philosophically opposed to raising animals for human consumption. If you are among them, I respect your right to hold that belief and realize that we'll probably never be able to find any middle ground. For those of you who do consume meat and are concerned about the way that your meat is raised, I hope you will give consideration to what I have to say. The undercover video was damning. If you saw the documentary, there's no need for me to rehash it here. Much of what was shown is simply unacceptable and indefensible in today's world, and I'm sure it's being discussed at length today on websites and around water coolers. Equally as disturbing to me, though, was the running commentary that seemed to suggest that the footage shot at this particular farm was standard operating procedure on all or most livestock farms throughout our nation. This couldn't be further from the truth! Quite frankly, it made me angry that the filmmakers were trying to imply that I and other family farmers across this nation held our animals in such callous disregard. American farmers view their roles in life as stewards of creation, responsible for using creation in a respectful way for the betterment of humanity. Those of us who raise livestock strive to provide the best of care to our animals so that both their life and death will be of maximum benefit to our fellow man. To do otherwise would violate the sense of ethics and morality that most of us hold at the core of our being. I raise my calves from birth to grow into strong and healthy cows that will not only provide lots of quality milk during their life, but will also provide quality beef through their death. The only way I can do so is to provide the best care I possibly can to my cows. Yes, my bottom line depends on it, but my conscience demands it even more. Livestock care is constantly evolving as farmers are working in partnership with veterinarians, scientists, and other animal experts to develop best management practices that will allow us to continue providing safe, abundant, and affordable food to the public. We see the social and cultural consequences of not following animal care guidelines and are holding each other accountable for raising our animals with care and compassion. And never forget that you, the consumer, hold us accountable every time you walk into a grocery store or market. The choices you make dictate both the food we supply and the methods as to how that food is produced. If you have any questions about how your meat is raised, please ask! We farmers are happy to talk about the things we're doing on our farms. If you have anything for me specifically, please comment on this post or contact me via GilmerDairyFarm.com. You can also check out several of the links on the right-side column of this blog or go to sites such as Dairy Farming Today to learn more. I read an interesting article over the weekend on the New York Times website about California farmers launching a movement to split the state in two. The call for succession is based upon their viewpoint that state serves only the wishes and needs of the heavily populated coastal areas and adopts policy which often handcuffs the Central Valley's large and vitally important agriculture industry. In addition to ignoring the agricultural industry's long history of supplying both needs and wants, Mr. Florez apparently doesn't do the grocery shopping for his household. Nowhere in the world is there a greater variety of food products available than on the shelves of America's grocery stores, markets, and supermarkets. Organic vegetables, cage free eggs, etc., are all available because there was enough consumer demand to create a market for those products. Farmers aren't ignorant...we know that our customers have lots to choose from and they aren't forced to buy what we're selling. We each have an opportunity to find a niche, and many have been successful in doing so. We also realize that some products that were once niche are now mainstream, and we have to adjust our operations to provide those products or we'll find ourselves out of business. Our customers need our government to implement certain rules and regulations to protect the integrity of our food supply; that is, there need to be assurances in place that our food is safe, affordable, and abundant. What our customers don't need is our government passing rules and regulations that limit their options by taking otherwise safe food products off the shelf. I'll give you an example of how the system works without government interference. A couple of years ago, milk processors around the Southeast begin telling their suppliers that there was a growing demand among consumers for rBST-free milk. If you're unfamiliar with rBST, it is a naturally-occuring hormone that can be administered as a supplement to dairy cattle in order to stimulate increased milk production. Numerous tests have confirmed that there is no food safety risk whatsoever with its use, and that milk from cows with supplemental rBST was virtually indistinguishable from milk given by cows that had not received the supplement. Regardless of the science, the consumers still wanted rBST-free milk. So, the processors worked with their suppliying dairy cooperatives who in turn worked with their member farmers, and we were all able to work out a production model that was good for everyone...the farmer, the processor, the retailer, and the consumer. Today, rBST-free milk accounts for most (if not all) of the milk produced and processed in the Southeast. Farmers and consumers are constantly sitting at the table together, and there's no greater negotiating tool than the grocery shopper's checkbook. We all come out ahead when we allow market-driven demand to dictate what is supplied, so let's limit the government's oversight to food safety and continue claiming the right to choose our food products for ourselves. We didn't do a whole lot today on account of the rain. There were the everyday duties of milking and feeding, we put out a few bales of hay, and we diagnosed a few minor problems on our Case 5230 in the shop this morning. Our milked was picked up today, and based upon the weight our cows have increased their production by about two pounds apiece over the last three day period. After things were wrapped up at the farm, I took a few minutes to contact my legislators about a couple of pending issues in Washington, DC. I asked them to oppose the administration's proposed cuts to the farm safety net and to support introduced bills that would prevent the EPA's "cow tax" from becoming a reality. I'm about to wind it down for the evening 'cause 2:45AM will be here before I know it! In closing, let me recommend fellow YF&R Committee member Val Wagner's blog post about why we in agriculture need to embrace electronic media. The rain started falling about 4:00am and looks like it will continue throughout today and into tomorrow. So far, it's been light and steady...just what the doctor ordered for our spring forage crops! Other than getting our heifers fed and a few bales of hay put out, I'm not sure what we'll get into this morning. We'll probably spend some time tinkering around in the farm shop this morning so as to keep a roof over our heads. I'll be back in the dairy parlor this afternoon to assist with the milking chores, barring nuclear holocaust or my wife going into labor of course. In the meantime, take a moment to visit the good folks at Orange Patch Dairy. They have some excellent stories to share about how they take good care of their cows. If you're in the dairy business or have read my blog for very long, I think you understand that these aren't very prosperous times. Our prices are low and profitability is nearly non-existent, and we're constantly monitoring the threat of radical activism and governmental policies/regulations that could further impact our industry. And let's not even speculate as to whether or not we'll get the right amount of rainfall this year! And, of course, we dairy families are not alone. Many other families...farming, ranching, and otherwise...are enduring their own unique but just as painful issues right now. But despite the current cloud of doom and gloom around us, we can see some light when we step back and look at the big picture. The sun still rises over our eastern fields every morning, our livestock are healthy and productive, the grass is green and growing (at least here in Dixie), our kids are being raised in the best environment on earth, and we know if we weather the current storm things will be better in time. So to all of America's dairy, farming, and ranching families, I raise my glass of milk high to salute you! If it wasn't so hard, everyone would do it! And that, my friends, is how we know that we'll always have a future. So here's to brighter days ahead, and may God bless us as we continue to provide the safest, most affordable food supply in human history. President Obama's 3.6 trillion dollar budget proposal would call for the USDA to cut direct payments to farmers with annual sales over $500,000 (and steer nearly all of it into new spending on non-farm programs). The proposed limit has been set to cut off assistance to "wealthy farmers" but is based on gross sales without any consideration of on-farm expenses or profitability. It also doesn't take into consideration that family farms such as mine have to support more than one household. This measure would be considerably hard on the nation's dairy industry as we are all struggling mightily with profitability issues right now. "If you got a 100-cow dairy, you're probably going to have over a $500,000 gross [income]. So you'll probably surprise the Minnesota 100-cow dairyman that he's a millionaire." I'm back home on the farm after a very good business trip up to Washington. I'll be getting back to the normal routine tomorrow morning. Maybe I'll dream up something interesting to blog about tonight or conjure up something while putting the feed out in the morning. If nothing else, I'll probably have a short blurb about Obama & Villsack's plan to slash over 1 billion dollars out of the farm safety net. Until you read again, I bid you farewell. Today's been a pretty easy Saturday so far. I went out to milk the cows at 3am, and about half-way through milking left that duty with my dad and an employee so I could put out the cow feed and feed the heifers as well. We had all of those duties finished by 6:30, and my dad and I went back at 8:30 for a few minutes to move the cows into a grazing pasture. I spent a few minutes landscaping once I got back home but have been inside ever since. I'm about to eat lunch and will then probably knock a few golf balls into the hayfield before going back to the farm around 1:00. I'll be leaving Gilmer Dairy Farm early Sunday morning to catch a flight from Birmingham to Washington, DC (via Atlanta, of course) for the AFBF Young Farmers & Ranchers Committee new member orientation meeting. I can only hope the weather up there is as good as what it is here! I don't know if I'll have the time or a reason to blog while I'm there, but I will if I can. 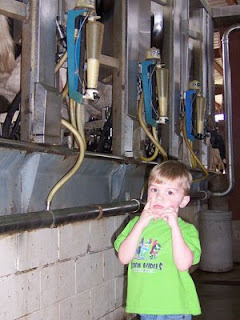 In the meantime, check out the SwissLane Farms blog's interesting take on raw milk sales. I'll be back home Tuesday evening, and will be farming full speed ahead on Wednesday. Have a great next few days! Today started off without incident. The cows were milked, the cows were fed, and we adjourned for breakfast. Halfway through my second cup of coffee, my wife told me to look out the back door. There I saw three calves wandering around on the wrong side of the fence. I put the coffee down and went out to put them back in there place. The road I live on curves in front of my house and limits how far a person can see ahead of them, so it certainly would not have done to let the little things wander down the hill and into the road. Luckily, I banged on the feed can a couple of times and the went right through the gate. After returning, things still continued to flow smoothly. We a.i. 'ed two heifers and then three of us resumed patching the cracked engine block on our JD4030 while a couple of others went to repair fences. As the morning progressed, we decided that I should hook up our grain drill, drive through a few pastures, and plant wheat into any bare spots I found. Well, to hook up the drill I first had to unhook the manure spreader. I dropped the jack, pulled the pin, and unhooked the pto and hydraulic hoses. I cranked the tractor and put it in forward, thinking everything was good to go. I had forgotten, however, to throw out the spreader's unloading speed rope. So, as I pulled forward the metal handle on the end of the rope pulled hard into the back glass and shattered it. So if any of you have the back window for a Case 5230, please let me know. Anyway, I did get the drill hooked up and spent the rest of the morning and most of the afternoon planting wheat. I parked the tractor for a few minutes mid-afternoon to again talk about this blog on DMI's webcast. Meanwhile, normal afteroon duties of milking and feeding were being handled by my dad and our employees. The day ended with dad and I replacing a valve on a leaking water trough. So here I am, back home and finishing up a blog that I'm not sure is too terribly insightful or interesting. But, if you made it this far into it, I guess it was worth something! Now, if you'll excuse me, my smell of my wife's hamburger steak is beckoning me into the dining room. It's been a weekend of weather extremes here in Alabama. We've had warm weather, severe thunderstorms, tornado warnings, cooling weather, and snow all within a 48 hour window. It was snowing when we left Montgomery this morning, but the 2 inches that had accumulated at our house had all but vanished by the time we pulled up the driveway a few minutes before noon. Despite the weather, we really enjoyed attending the Young Farmers Leadership Conference over the weekend. It's always refreshing to spend a couple of days with my peers from across the state, especially since there are no other young farmers locally. The speakers and workshops are always really good, but catching up with old friends and making new ones is always the highlight for me. Back on the farm, the milk pump in our parlor stopped working early Saturday morning. Luckily they were able to get the equipment man there to install another one within about three hours. It's kind of a reversal of fortune in a way, because that type of thing usually only happens when my dad is gone and I'm the one at home on the farm. Anyway, that pump gave us about 20 good years, so we can say we certainly got our money out of it. I'm not sure what we'll get into this week other than the normal milking and feeding. There's a good chance we'll be in the shop working on some of our farming equipment, but there's an even better chance some unforeseen thing will arise that we have to take care of. Such is life on a dairy farm.